The OTvest™ denim weighted vest soothes anxiety and provides trunk stability to the wearer engaging in hippotherapy, equine therapy or therapeutic riding! Hippotherapy is administered by an occupational or physical therapist who has been trained specifically to use a horse in therapy. The therapy goals of special needs individuals are achieved by using the movement of the horse. In this case, the horse is used to influence the person, rather than the person directing the horse. When the therapist observes the client’s response to how the therapist directs the horse, goals can be adjusted. In this setting, the OTvest™ denim weighted vest can be useful in helping treat anxiety for an individual that is transitioning to equine-assisted therapy. The mild pressure on the scapula (shoulder-blade) and across the upper chest and back that the OTvest™ denim weighted vest provides increases the trunk stability, and can stimulate pressure down into the saddle. Therapeutic riding, as opposed to hippotherapy, focuses on teaching riding skills for health, education, sport, and recreation. Horseback riding lessons in this instance are adapted to those with disabilities. 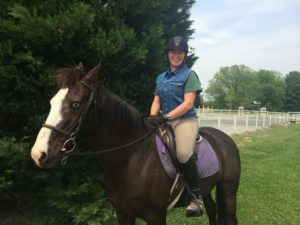 Therapeutic riding doesn’t require a medical professional, but most instructors are PATH International (Professional Association of Therapeutic Horsemanship) certified, meaning they are trained in working with people with disabilities. 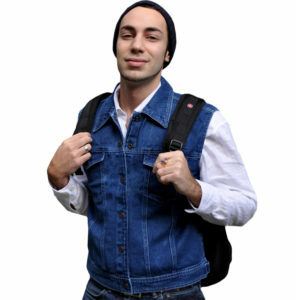 The use of the OTvest™ denim weighted vest, as described above, applies in the same ways for use in therapeutic riding. Just received my OTvest™ less than an hour ago. I love it and can already tell I am using my arms better. I am even being more accurate with the keyboard as I sit to type this. My PT and therapeutic riding instructor have been working very hard on my shoulders and arms this week, as they were extremely tight. I put on the vest and they went immediately limp. It is as if I don’t have any tone at all in that area, which of course has calmed my whole system down. The vest feels very much like my therapist’s hands constantly on my shoulders. First impressions are that I love it! I don’t want to take it off! Hippotherapy, therapeutic riding, and the OTvest™ denim weighted vest can be used to help treat autism spectrum disorders. The OTvest™ can help naturally treat cognitive disorders, help naturally treat ADHD, help naturally treat cerebral palsy, sensory processing disorders, speech and language impairments, and more! Look for the yellow "OTvest" label on the chest pocket to make sure you are getting the genuine OTvest. Others may look like the OTvest from the outside, but the weight placement is important. Only the OTvest has the patented weighted insert with weight lying directly upon the body. This makes the difference! For more detailed information, please visit http://herosource.com/blog-test/top-12-therapeutic-riding-centers-in-se-michigan.html. The above information is adapted from this source.